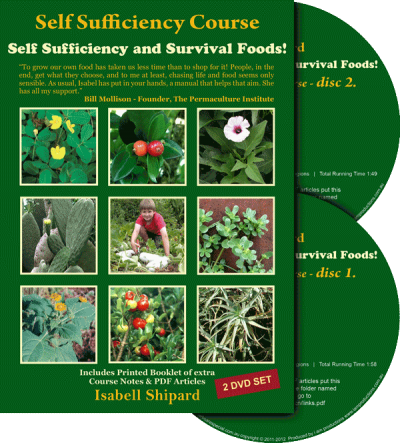 In Isabell’s Herb and Self-Sufficiency books she writes about the value of weeds. 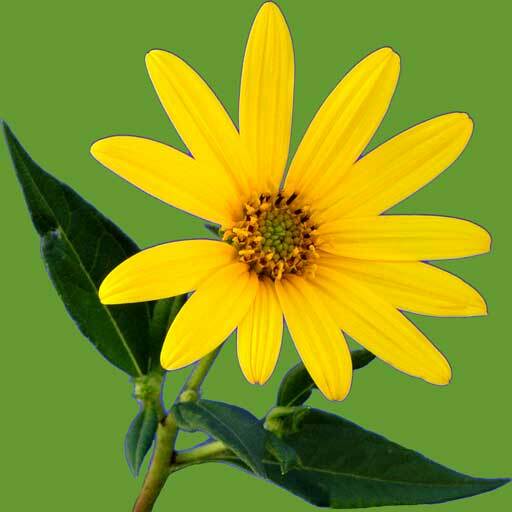 Common garden weeds that are valuable to know about and use. Chickweed (Stellaria media) a common annual weed in gardens, roadsides and parks. Thrives in the cooler months and in shade, as a sprawling ground cover. In some areas of Europe, chickweed is encouraged in orchards, as it is believed to increase yields of fruit. For this reason, it was planted in vineyards on the Rhine. The flavour of young leaves could be considered as a cross between comfrey and lettuce; so, perhaps we could say it is a chlorophyll fix! 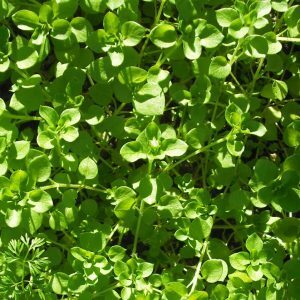 Chickweed has a protein content of 15-20%. Leaves are rich in iron, and a good source of calcium, chromium, cobalt, molybdenum, magnesium, manganese, silicon, zinc, and vitamin C (analysis has found between 150-350mg per 100g of leaves). Dandelion (Taraxacum officinale) might be a weed you have been pulling out of your garden. It has powerful healing potential. 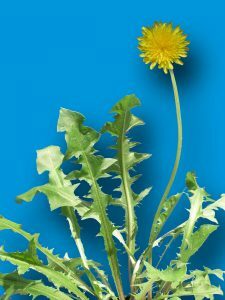 Please make sure you are eating true dandelion, as there are look-alike plants. Be careful to not mistake it for look a-like plant called Flatweed. 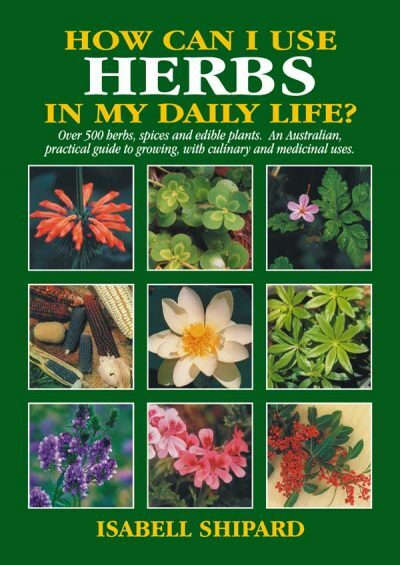 For details of description of both these weeds, refer to the Herb Book. Dandelion is an outstanding liver cleanser and strengthener. It is a traditional folk remedy to heal and tone up the liver, also a herb to relieve food allergies and aid digestion, as well as repairing damage that may have been caused by drugs, chemicals, alcohol, and infections conditions, like hepatitis. Nettle (Urtica dioica and Urtica urens) yes, both these species are valuable herbs for well-being. You may just have one of the species growing as a wild weed in your area. Nettle contains germanium, is 20% protein and has a range of antioxidants and polysacharides. Polysacharides, researchers indicate, strengthen the immune system, lower blood pressure, cholesterol and blood sugar levels, and reduces the stickiness of platelets making it harder for them to build up in artery walls. Nettle is valuable for us, as it is rich in chlorophyll, and iron, essentials for blood building, oxygen transfer, healthy bones and skin, and synthesis of neuro-transmitters, which are chemicals located and released in the brain, to allow an impulse from one nerve cell to pass to another nerve cell, thus allowing the body to perform at its best. 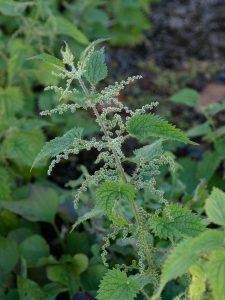 Nettle has often been a survival food, for people in times of hardship. Plantain Broad leafed (Plantago major) perennial 30-60cm tall, a rosette of wide leaves 4-10cm long, with prominent longitudinal veins. Plants send up a number of fine leafless stems, each with a terminal spike of small, inconspicuous, green-white flowers, followed by small seed capsules containing hundreds of very fine brown seeds. Add leaves to green drink smoothies with other herbs and fruit juice like pineapple. 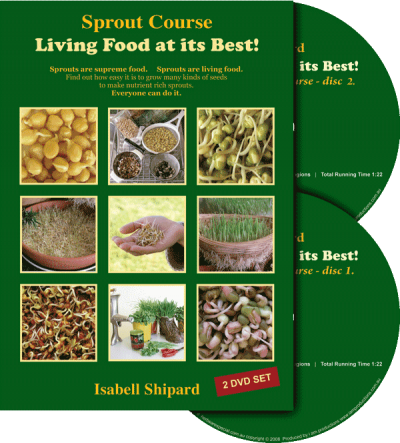 Use leave raw, cooked, and for many therapeutic benefits. Purslane also called Pigweed (Portulaca oleracea) Purslane was growing in Australia before white man came. Early explorers observed Indigenous Australians collecting the tiny black seeds to mix with water and cook in hot ashes. The flavour of the seed is much like linseed. 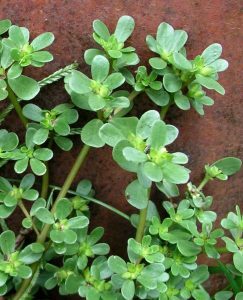 An annual plant and extremely hardy, purslane grows as a thick, mat-like ground cover with succulent stems, often with a red tinge; oval, succulent leaves, 1-3cm long. Each plant has potential to produce thousands of seeds and it is said that their germination power can last seven years, plus. 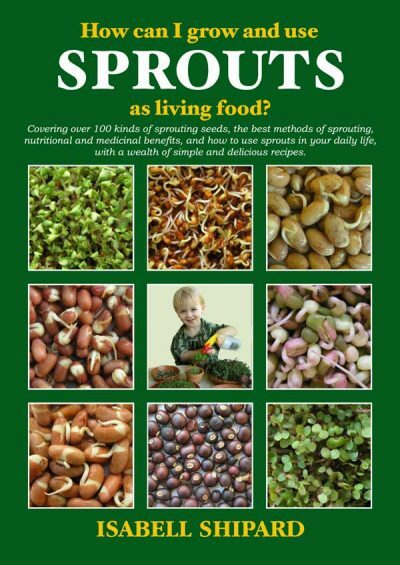 Leaves are an excellent source of Essential Fatty Acids; eat raw and cooked in stir-fries, etc. Purslane grows without any help in sun or shade, in any soil and climate, without fertiliser or water. NOTE: Before eating weeds, it is your responsibility to positively identify any plant material. Not all weeds are edible. The leaves of many weeds can be eaten raw. Nibble on leaves when in the garden or add to a tossed salad, tuck in a sandwich, make into a smoothie, add to a pesto, or use as a garnish on a meal. Add leaves to a cup of boiling water in a teapot, and add other herbs to give aroma and flavouring, like lemon grass or spearmint. Stir, steep a few minutes, drink, and enjoy the health promoting benefits. Weeds also have many therapeutic benefits. 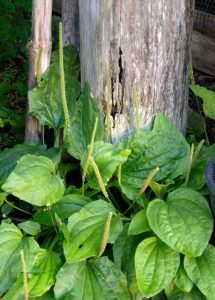 Here, I have shared details of a few common edible weeds. Some of our edible weeds are native plants, which have been spread by man or animals, while others are weeds or herbs that were introduced by early settlers, knowingly, or as seeds that had a free ride on clothes or shoes. 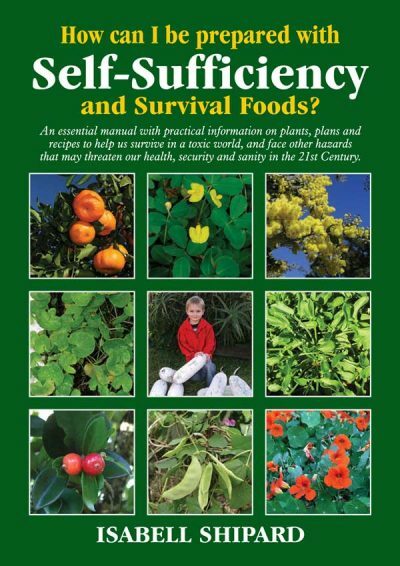 If you wish to discover more about edible weeds in your particular area, seek out an old-timer in your neighbourhood, or join a Permaculture or Organic growers group. 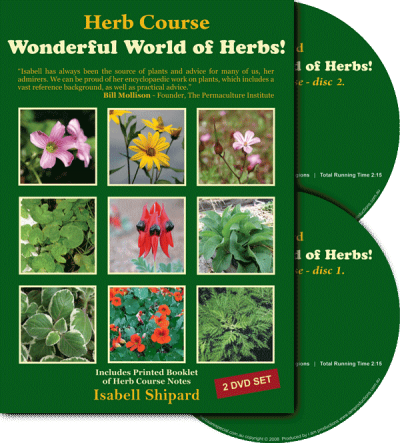 Find out more about weeds and and how to use them in Isabell’s Books and DVDs. Like our new Facebook page. Click here to like it and share it with others. 5 Weeds in Every Garden That are Actually Edible & Delicious!